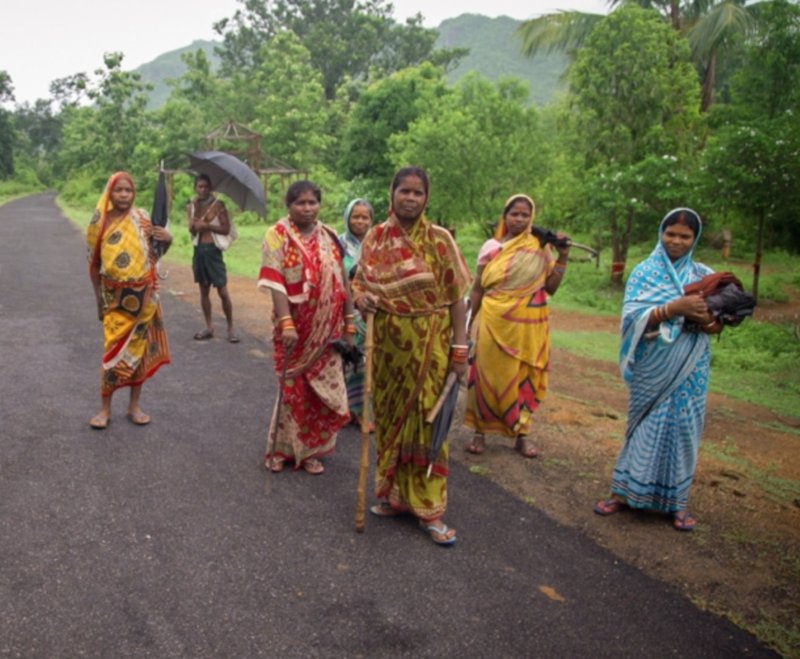 The women of Ghunduribadi, in the eastern Indian state of Odisha, have taken over the task of guarding the forest they’ve used for generations from intruders and illegal loggers. Due to a landmark 2006 law, they can finally reclaim title to these ancestral lands that were expropriated by the British in the 19th century (photo: Sam Eaton). Not long ago these women would have been considered trespassers here. Nearby, there are heavy stone markers laid down by the British in the 1800s when the government declared this forest its own. 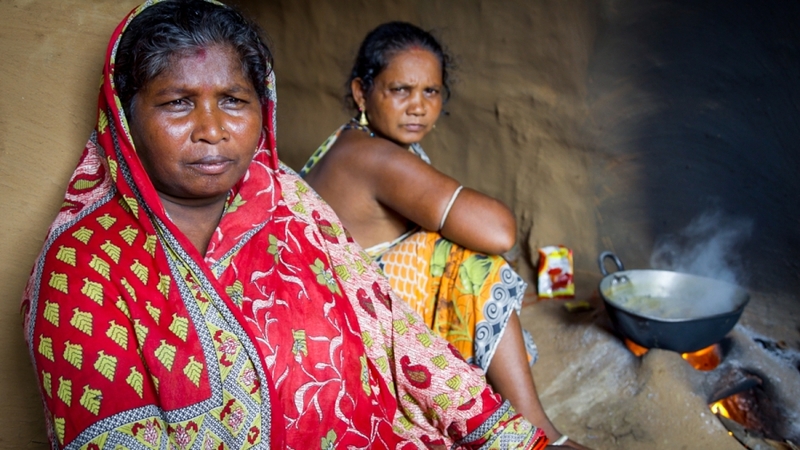 But now, under India’s landmark 2006 Forest Rights Act, tribal villages like Ghunduribadi can claim title to their ancestral lands, some 150,000 square miles of forest all across India. That’s an area almost the size of California, making it one of the largest land reforms in India’s history. That is, if the law is actually carried out. “There’s no commitment to even making people aware of the law,” said Madhu Sarin, who led the grassroots effort to pass it. She said today, nearly a decade after the law was enacted, not even two percent of those land rights have been granted. As India’s economy surges, she said state-owned forests continue to fall to industrial development. “Coal mining, iron ore mining, bauxite mining, huge hydro dams,” she said. Today, as many as a quarter of India’s districts may be embroiled in conflicts with local communities over land rights. Sarin said the Forest Rights Act gives those same communities a much bigger stake in fighting to keep their forests standing. And she said it is women who are taking the lead. In forest-based societies like Ghunduribadi, a woman’s status is closely linked to her role in the common property of the forest. The day I joined the daily patrol in Ghunduribadi, the women at the front of the pack caught poachers from another village, three men loading freshly cut timber into a three-wheeled auto rickshaw. The men are paraded back to the village to face a committee that will decide their fate. The women later tell me that if I hadn’t been there with my camera and microphone they would have beaten the men with their sticks. Instead, they got off with a stern warning. Back in the village after the patrol, one of women named Janha Pradhan cooked a curry from a tuber she harvested in the forest that morning. It’s called a kadaba, Pradhan told me, and because it’s wild, it packs more nutrients. She said by eating foods from the forest like this every day, the people in her village never get sick. It’s an oasis of health in a region plagued with malnutrition and poverty, and one of the reasons the women so fiercely protect their forest. Thirty years ago, when the men from her village were in charge of protecting the forest, Pradhan said it was nearly barren from overuse, providing little wood or food. Then a series of devastating droughts hit the region. Pradhan said at times, families would only get a handful of rice. Mothers, she said, would feed their children but go hungry themselves. That’s when the women organized to restore and protect the forest. They banned goats from the land to allow the trees to regenerate. Anyone needing wood had to get permission from the village committee. Men were no longer allowed to carry axes into the woods. Sarojini Pradhan, another member of the patrol, said when the men were in charge they would fight over the rules, often allowing illegal loggers to get away. But she said after the women began patrolling, the number of intruders dropped to nearly zero and the forest quickly began to flourish again. Even the men here credit the women for the dramatic reversal. Today the forest again helps produce clean drinking water and natural fertilizer for the village, which in turn has helped dramatically boost crop yields. It’s an invaluable buffer against hunger and an increasingly unstable climate. But those hard-earned benefits remain precarious until the village secures official title to the land under the Forest Rights Act, a process being held up by Indian bureaucracy. Janha Pradhan remains hopeful and told me the community will celebrate with a feast the day those rights come. She said gaining title to the forest will officially give women equal rights to the land and will ensure that these trees and the bounty they bring are protected for generations to come. Janha Pradhan (L) prepares a curry with a tuber she harvested while on patrol in the forest. She says wild foods from the forest are omre nutritious than cultivated ones, and can be an essential part of the local diet during droughts or between harvests (photo: Sam Eaton).